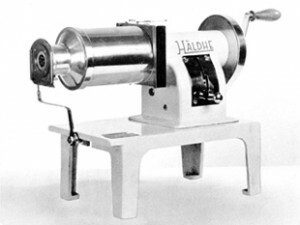 For more than seven decades now, HALLDE, located in Sweden, has produced food preparation machines. The founder Mr. Ernst Hall had a brilliant idea – to construct a machine that produced beautiful soft pieces of butter that were easy to spread. This also made the butter portions look bigger – a big plus during this period and its rationing. The timing was perfect. Ernst and his new company got a flying start. 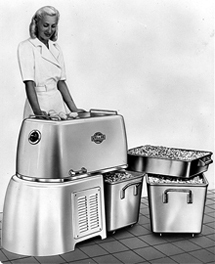 A Hallde Vegetable Preparation Machine from 1948. The butter portioner was followed by other products and pretty soon HALLDE started to produce Vegetable Preparation Machines. The Vegetable Preparation Machine was a great success and it did not take long until foreign buyers were knocking on Mr. Hall’s door. 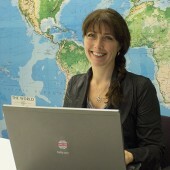 Today HALLDE has more than 200 representatives in more than 80 countries, on all continents.